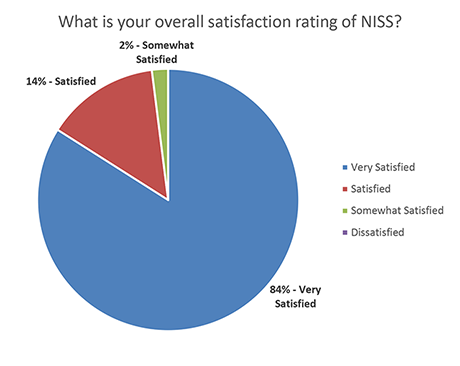 NISS is very pleased with the responses from the survey. We will continue to do all we can to make the reporting process as easy and simple as it can be. Each year on November 15th, NISS sends the Residual Market Participation Quota Determination to AIPSO on behalf of our member companies. Companies that write voluntary automobile policies are required to write a proportional number of residual market automobile policies, and AIPSO determines each company's quota based on the data NISS sends. In order to provide AIPSO the correct amount of premium for each company, we may have to take into account premiums that are included on your annual statement as automobile but may not be reported in the data submission to NISS. For this reason, the Membership Fee (MBR) Call is collected. The MBR Call includes membership or policy fee data with premiums separated between drivers under 25 years of age and senior citizen drivers. These fees can also be reported in the automobile data submission, however, if they are excluded, the fee amounts need to be reported with the MBR Call. By either including the membership fees in the data submission or reporting the amounts on the MBR Call, we can ensure that we are sending AIPSO the correct premium amounts. This will also ensure that each company is receiving the proper credit for writing drivers under 25 years of age and senior citizen drivers, and that they receive the correct number of assignments from the quota determination. NISS is a unique resource for the property/casualty insurance industry. We collect and report timely, quality insurance data and perform other related functions at a reasonable cost. For more information, please visit www.niss-stat.org. For a list of upcoming due dates, please click here. Two parents have seven daughters. If each daughter has a brother how many children do they have total? Please email your answers to NISSNews@niss-stat.org. A person will be randomly drawn from the first ten correct answers, and that person will win a $25 gift card from Amazon.com! For the question and answer from the last brain teaser, please view the NISS News section here. You are receiving this e-newsletter as a member or prospective member of the National Independent Statistical Service, or you have subscribed by submitting your name and e-mail address. SUBSCRIBE: If someone had forwarded this message to you and as a result, you would like to subscribe, please click here. UNSUBSCRIBE: If you wish to unsubscribe, click here. COMMENTS: Please direct all requests or comments to NISSNews@niss-stat.org, or to NISS News, 3601 Vincennes Road, Indianapolis, IN 46268. © Copyright 2017 NISS. All Rights Reserved.